Your midnight movie is from the UK. This is from 2006 before we had $140 a barrel oil in 2008 and before the financial crash. The film is set in 2016 and is a combination of fiction plus documentary about Peak Oil. It has a bad title, If the Oil Runs Out. Oil "running out" is not the issue, of course. 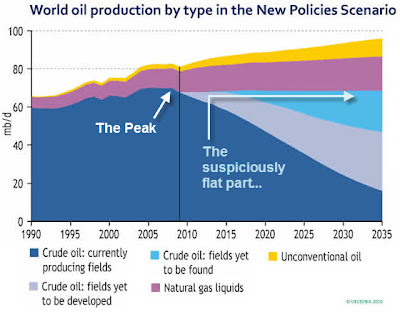 We are experiencing the global peak of oil production. It is the end of cheap oil--the stuff that built everything we have. That is why tar sands and all that other doesn't matter. Sure, we can extract hydrocarbons (with huge environmental costs) but the rate of their extraction can never be enough to replace liquid petroleum. Here is your midnight movie. The drama focuses on the changes families will experience.